I finally made some headway in the ol' Spare Room Project this weekend! I was on a mission to get all the accessories and decor I needed to get my Dressing Room finished up. Thankfully, I was successful! There is quite the eclectic mix of decor in my soon to be dressing room! Just the way I like it! I went on a little antique-ing trip to Stillwater and picked up this awesome vintage crate for only $8.50 at Midtown Antiques. I dont' have the exact measurements, but it was a really generous sized crate! I love the handpainted 'Vine Ripened' label on the side. I am planning to use as decor/ storage. 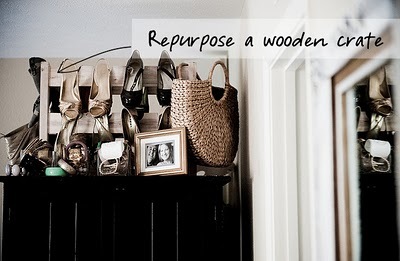 In my inspiration post I showed this image from Arianna Belle, I love that she used an old crate to display shoes. I am thinking I will do the same with this crate. Now to my Ikea accessories! Last week in Houzz's Ideabook, I read a post about "Warming Up With a Sheepskin Throw". I thought a Sheepskin rug would be a perfect accessory to warm up the space and give it a little feminine glamour. I picked up 2 faux sheepskin rugs ($12.99 each), the real deal gave me the creeps since I didn't know if a sheep had to die to make a rug. The faux ones looked just fine. The only problem with the rugs...Sadie was convinced that these were a toy for her (I guess I should have expected that, they are a little weird). It took a lot of tries setting them on the floor and making sure she didn't run away with them. She spent a lot of time 'inspecting' them. I also picked up this AWESOME mirror name Stave from Ikea for $49.99. I am soooo happy with this mirror, I love the way it leans on the wall and it is a pretty big size measuring 27.5"W x 63"L. It really completes my room and gives it a glamorous feel! The last item I picked up at Ikea was this Dalfred stool for $39.99. I knew I wanted some kind of chair in the space that would be easy to move around and use. I thought this stool was perfect and matched the style of the garment rack and antique dressform. On to the handmade item! Here is the vintage inspired sign I made to hang above my garment rack. It reads "La Vie Dans Le Talons" translating French to English "Life in High Heels". I thought that was the perfect little saying for my Dressing Room. I have to add, the whole time I was painting the sign I kept doing my Nepoleon Dynamite impression and saying "Do the chickens have large talons?" Alex just loved that (JK), but I couldn't help it since le talons is French for high heels, such a weird word! So here are some pictures making the sign. Before I got started, I just grabbed an extra piece of wood we had laying around in the basement and spray painted it black. Once it was dry I got ready to add the text. I didn't have a stencil for the letters so I used a larger print out as a guide and freehand penciled in the writing. The cursive letters were a bit tougher to freehand. Once I was done, Alex added some frame hangers to the back and hung it up behind my garment rack. I love the fun personalized touch it adds to my space. As you can tell I am almost done with this space! I'm really happy with the way it is shaping up, I just have to get it a little more organized before I can post the afters, but that is next! I can't wait to show you the room this week, eeeeek! The Dressing Room Is Complete! Before and Afters, Clothes, Shoes, Decor, and More! Head Over Heels: Vintage Windows... Weddings and More!